Bobbe Pennington reads 'Salt' aloud to her fifth grade class. Danielle Vincent adds to her class's Venn diagram about the book 'Salt'. Fifth grade teacher Annick Cooper asks her class to think about the themes in 'Salt'. All three fifth grade classes at Rick Marcotte Central School, in South Burlington, got together to discuss 'Salt'. Today Fort Wayne is a city with over a quarter-million people. In 1812 it was a military fort in the Indiana territory, and home to about 80 American soldiers and some of their families. More American settlers lived and farmed in the area surrounding the fort, inside a stockade. In Salt, that’s where James and his family ran a trading post. The character Anikwa and his family lived within walking distance of the stockade in Kekionga – part of the Native American Miami nation. 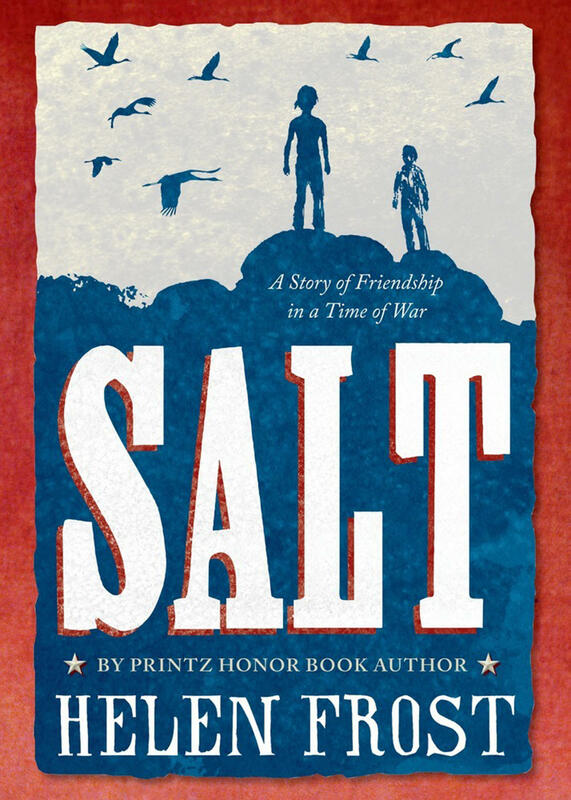 Kimberly Hurer: Why did you choose to call your book Salt? Helen Frost: Finding a title for a book is something that I work really hard at ... So, in Salt, I realized that the book was a lot about how people live on the earth together and who has access to the resources of the earth. So salt was a very specific thing that people needed, but it’s also symbolic because of the way it comes out of the earth. So, for me that one word title, I don’t think it was over-simplified but it was really just one element of the book that I chose to use to focus a lot of what I was saying. The earth lifts and tilts. Helen Frost: Wow, what a beautiful thing for you to read my poem back to me, thank you. I think that the salt poems give depth to the story. Because it takes it before the story began, way, way back. You know, it goes back to the beginnings of when the ocean covered this whole land – before either Anikwa’s people or James’ people were here. So, it just gives it more depth and I thought a lot about that and I did a lot of research about salt too – how it was formed and how it came to be here and how it was negotiated. It’s not all in the book directly. You can’t have all the answers to every question of what happened to salt in the story, but it’s behind the story. And I thought that it was important to give the deeper truth about how salt came to the earth in the first place and where it goes after the story ends, too. Silas O’Brien: What inspired you to write about the War of 1812? Helen Frost: I would say my inspiration was from the land. There are three rivers that meet here, and so I was really interested in how those three rivers had been important throughout history. And 1812 turned out to be one very important event in history, when the fort came under siege. And those 10 days or so in September were, to me, a turning point in the history of our community, where things could have gone one way or another and … There’s a lot of points like that throughout history, and even now, where we look at things that are happening and we see things could go in one direction or another. And so 1812 seemed to be in this place – that kind of a year where it was a crucial year in terms of how history developed after that. 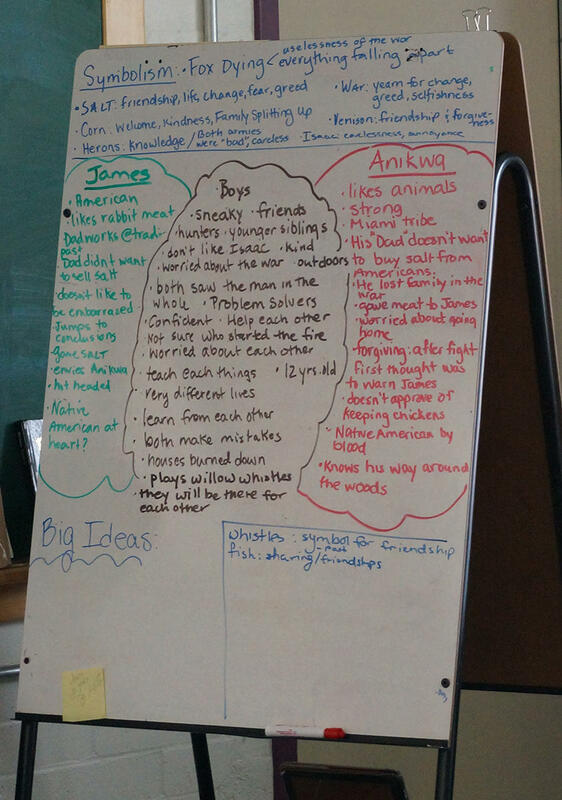 The fifth grade classes at Rick Marcotte Central School used Venn diagrams to organize their thoughts about James, Anikwa and the book 'Salt'. Catherine White: Why do you choose to write in poetry form? Helen Frost: Yes, that’s a good question, Catherine. You know, my training as a writer, when I was in college and after that too, was in poetry. And so I considered myself a poet, and I always wrote poetry but I liked what we call narrative poetry. That means poetry that carries a story inside it, or that’s part of what the poem is. So when I was writing a longer story, and if I started writing it without poetry, I really would miss what I think of as my poetry toolbox. By that I mean the way that words look on a page and the way they sound when you read them out loud. So I love having those tools available to me when I’m writing, whether I’m writing a story or just one single poem. And that’s why I chose to write Salt in the way that I did. Hayden Posey: How do you discuss so much in so little words? Helen Frost: You know, that’s a tough question because it’s not easy. I think of everything that I want to say and then I think of the way that I can say it most precisely. And this has to do with poetry too, to me, that poetry helps me focus on the details of language. If I have, especially in a book like this where I’m looking at each poem having only so many words, because of the shape. Then, if I have some extra words and I’m trying to make it fit into that shape, then I just sort of take out the extra words, almost like a sculptor would take a piece of granite. It’s almost like cutting out the words that aren’t needed in order to make it a stronger poem and still say exactly what I want it to say. Sofia Richland: If you had the chance to go and talk with James and Anikwa, what would you talk about? Helen Frost: Oh, what an interesting question, Sofia. ... If I could talk to them after they were adults, that would be interesting too, to see what happened to them after the story that I wrote ended. That might not be such a happy story for Anikwa because it turned out. … My story is in 1812, and in 1846 most of the Miami were forced to leave this land of Indiana. And they were moved first to Kansas and then to Oklahoma. So it would be interesting to talk to both James and Anikwa, maybe 30 or 40 years after the story took place and see what their lives had been like and what they had to say about that. It’s clear these South Burlington fifth graders will never look at salt the same way again. Next month on Dorothy's List, Courage Has No Color by Vermont author Tanya Lee Stone. Dorothy's List is supported by the VPR Journalism Fund.